Want to try your hand at an international mountain bike instructor/guide certification? Now is your chance to be certified as a group leader or an instructor/guide at the level you need. 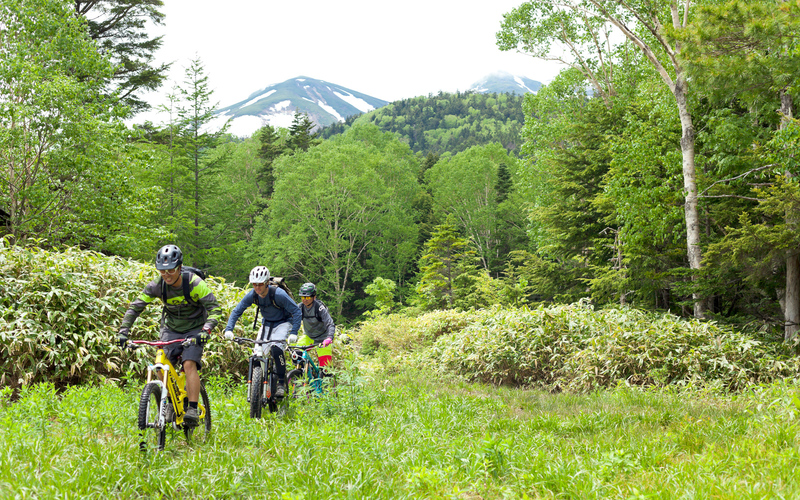 NORTHSTAR and other major mountain bike guiding companies in Japan have been pursuing the IMBA ICP to improve general guiding skills and the safety of guided tours. At this time, IMBA ICP is unable to operate outside of the US because of insurance restrictions; therefore, we have decided to alternatively run the PMBIA (Professional Mountain Bike Instructor Association) guide/instructors courses. We, mountain bike guide/instructors, really want more people to enjoy the sport of mountain biking. There are some certifying courses in Japan, yet mountain bike instruction methods are not organized well compared to the ski or snowboard industries. 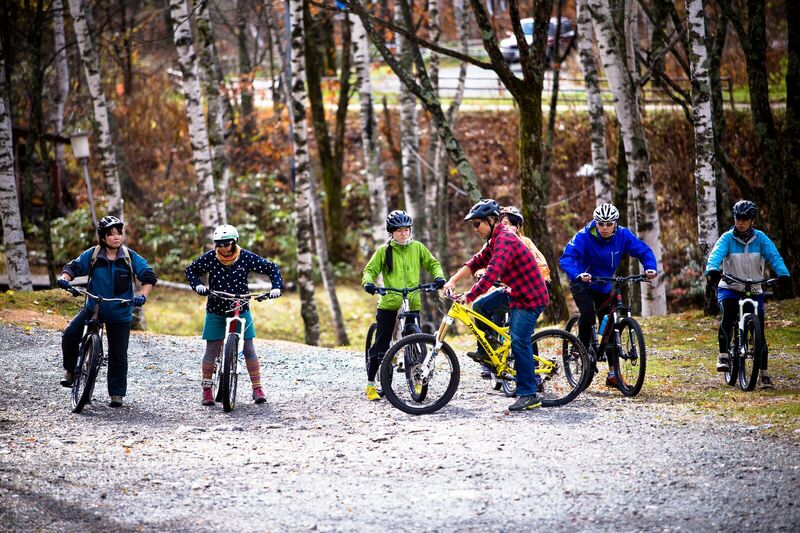 NORTHSTAR has been using the teaching and guiding methods of CMIC (Canadian Mountain Bike Instructors Course) – the original course of IMBA ICP – for more than ten years as an international standard. As we introduced CMIC to our guided tours, we found that the risk and rate of injuries dramatically decreased. Just like the CMIC, PMBI has been built by a collective of instructors and guides who have researched data for years and built up teaching methods around this. Also, many of these instructors are either ski or snowboard instructors in the winter who have experience developing and improving both personal teaching skills as well as the methods. Thus PMBI is both well researched and developed making it one of the easiest and most effective programs for riders to improve. Relatively, most sports instruction can only be taught based upon the experience of the instructor. PMBI has been developed in Canada with a large number of mountain bikers, and their proven methods show that their courses help riders get better in the safest, quickest and most effective way. *Please note that the certification is for mountain bike guiding and instruction only. The certification does not permit you to guide anywhere in Japan. To operate mountain bike guided tours and clinics you must receive the pertinent permission from landowners, administrators, managers, local government, etc. We are providing three courses for this season. Ride Guide is for people who have opportunities to lead groups on a ride. If you would like to become a professional mountain bike guide/instructor, the PMBI Level 1 course is where you should start. For those who have been certified at the IMBA ICP Level 2, you can take the ICP Transfer Course. All courses will be taught by an examiner from Canada. The deadline for application is August 31st. All courses require a 50% deposit of the participation fee upon application. ¥36,000 (w/o tax) *includes: 1 night lodging with 2 meals, course fee and insurance. ¥78,000 (w/o tax) *includes: 2 night lodging with 7 meals, course fee and insurance. ¥28,000 (w/o tax) *includes; course fee and insurance. Please contact us via e-mail for further questions.